With tonight’s second season premier of The Walking Dead, right on the heels of the jaw-dropping fourth season finale of Breaking Bad, following the award-winning fourth season of Mad Men and much buzzed-about first season of The Killing, AMC is on a roll right now. The programming is pleasing both critics and viewers alike, with record numbers of eyes tuning in to see what happens next. And by what happens next, I mean the November 6th (10PM EST) series debut of Hell on Wheels. Positioning itself as the forerunner in a current onslaught of westerns being developed for the small screen, Hell on Wheels tells the story of the building of the transcontinental railroad. 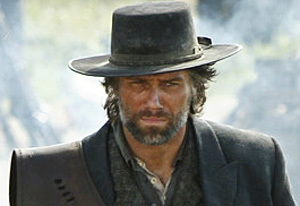 Actually, to be more specific, it tells the story of Cullen Bohannon (Anson Mount), a former Confederate soldier whose wife was killed in Meridian, Mississippi and his search for her killer, all set against the backdrop of the story of the building of the transcontinental railroad. Also in the cast is my future husband Common, who plays Elam Ferguson, a half White/half Black freed slave who feels outcast from both communities. Mount, by the way, is a former classmate of mine at Sewanee: The University of the South. In what has been a slow – yet continually upward – progression, he has finally gotten a leading role in a high profile, high-stakes drama on a well-regarded network. As a fellow alum, I am proud of him. Congrats Joseph!!! As always “Get On The Sofa” tells it like it is. AMC should be calling you by weeks end….Tell them they can’t afford u….unless it comes with $,$$$,$$$. We love you Joe. Continue doing the do….You!! !